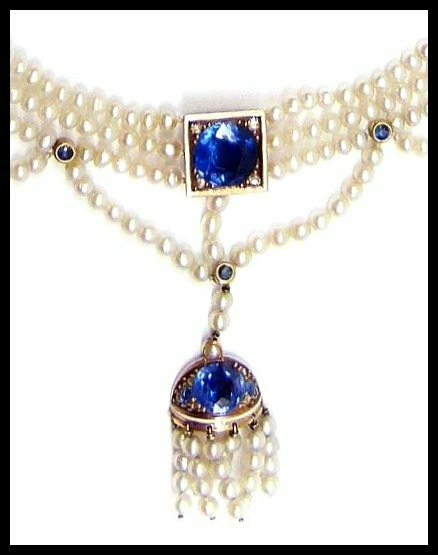 Antique sapphire and seed pearl necklace. You are here: Home / Jewelry / Antique sapphire and seed pearl necklace. I hope you’re in the mood for something shamelessly glamorous this morning, my darlings. 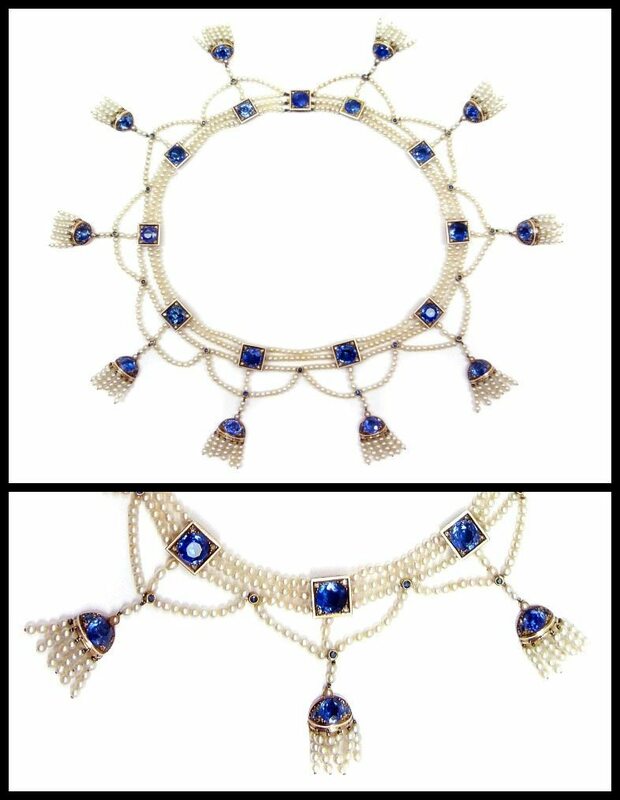 Isn’t this antique sapphire and seed pearl fringe necklace fantastic? It dates to 1900 and positively exudes opulent Edwardian elegance. The three dainty rows of seed pearls suspend a one further row of seed pearl swags, which in turn leads to 10 seed pearl sapphires. The entire confection is gloriously punctuated with rich blue sapphires collet set in gold and embellished with occasional rose-cut diamonds and white enamel. My favorite part of this necklace – besides the delicious color contrast between the sapphires, the yellow gold, and the creamy little pearls – is the movement that the tassels must have when this is on a living person. Can’t you imagine those pearl tendrils trembling delicately in the hollow of a lady’s collarbone as she sips lemonade at a fancy Edwardian soiree? Sigh. I can, and I want it to be me. Here’s a look at everything at once. This necklace is about 15 inches long, so it’s really almost a choker (although not quite). Wouldn’t this be amazing as a something old and blue with a strapless contemporary wedding dress? What do you think of it? Does it have you dreaming of balls with the Belle Epoque beau monde or wishing for something more streamlined? 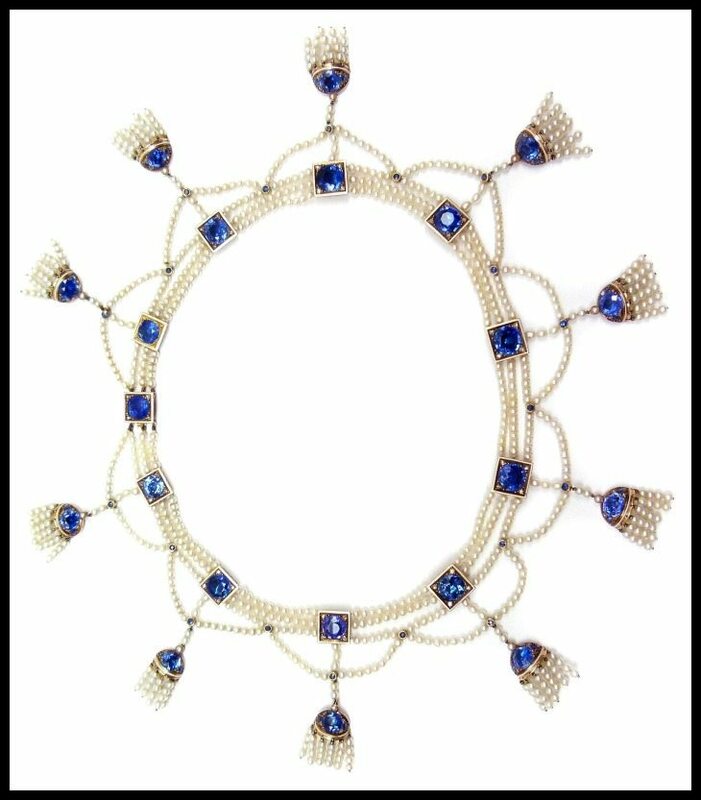 This lovely antique sapphire and seed pearl necklace is currently for sale at S.J. Phillips. All images and info are thanks to S.J. Phillips. It’s amazing!! Thanks for this post. And the pictures, of course! Becky you keep outdoing yourself! Love love love it. That’s what I like to hear! Thanks, darling.